Neal Katyal, the Paul Saunders Professor at Georgetown University, focuses on Constitutional Law, Criminal Law, and Intellectual Property. He has served as Acting Solicitor General of the United States, where he argued several major Supreme Court cases involving a variety of issues, such as his successful defense of the constitutionality of the Voting Rights Act of 1965, his victorious defense of former Attorney General John Ashcroft for alleged abuses in the war on terror, his unanimous victory against 8 states who sued the nation’s leading power plants for contributing to global warming, and a variety of other matters. As Acting Solicitor General, Katyal was responsible for representing the federal government of the United States in all appellate matters before the U.S. Supreme Court and the Courts of Appeals throughout the nation. Neal has orally argued 34 cases before the Supreme Court of the United States, with 32 of them in the last eight years. In the 2016-17 Term alone, Neal argued 7 cases in 6 separate arguments at the Supreme Court, far more than any other advocate in the nation. At the age of 47, he has already argued more Supreme Court cases in U.S. history than has any minority attorney, with the exception of Thurgood Marshall (with whom Neal is currently tied). Neal was also the only head of the Solicitor General’s office to argue a case in the U.S. Court of Appeals for the Federal Circuit, on the important question of whether certain aspects of the human genome were patentable. Neal’s interest in technology has led him to serve as a Board Partner at Social Capital, a Silicon Valley firm that focuses on technology and philanthropy. While teaching at Georgetown, Katyal won Hamdan v. Rumsfeld in the United States Supreme Court, a case that challenged the policy of military trials at Guantanamo Bay Naval Station, Cuba. The Supreme Court sided with him by a 5-3 vote, finding that President Bush’s tribunals violated the constitutional separation of powers, domestic military law, and international law. As former Solicitor General and Duke law professor Walter Dellinger put it “Hamdan is simply the most important decision on presidential power and the rule of law ever. Ever.” An expert in matters of constitutional law, Katyal has embraced his theoretical work as the platform for practical consequences in the federal courts. 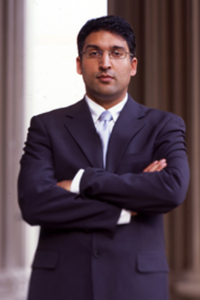 Katyal previously served as National Security Adviser in the U.S. Justice Department and was commissioned by President Clinton to write a report on the need for more legal pro bono work. He also served as Vice President Al Gore’s co-counsel in the Supreme Court election dispute of 2000, and represented the Deans of most major private law schools in the landmark University of Michigan affirmative-action case Grutter v. Bollinger (2003). Katyal clerked for Supreme Court Justice Stephen Breyer as well as Judge Guido Calabresi of the U.S. Court of Appeals. He attended Dartmouth College and Yale Law School. His Articles have appeared in virtually every major law review and newspaper in America. Katyal is the recipient of the very highest award given to a civilian by the U.S. Department of Justice, the Edmund Randolph Award, which the Attorney General presented to him in 2011. The Chief Justice of the United States appointed him in 2011 to the Advisory Committee on Federal Appellate Rules, and again in 2014. Additionally, he was named as One of the 40 Most Influential Lawyers of the Last Decade Nationwide by National Law Journal (2010); One of the 90 Greatest Washington Lawyers Over the Last 30 Years by Legal Times (2008); Lawyer of the Year by Lawyers USA (2006); Runner-Up for Lawyer of the Year by National Law Journal (2006); One of the Top 50 Litigators Nationwide 45 Years Old or Younger by American Lawyer (2007); and one of the top 500 lawyers in the country by LawDragon Magazine for each of the last ten years. He also won the National Law Journal’s pro bono award. Katyal has appeared on every major American nightly news program, as well as in other venues, such as the Colbert Report. Neal Kumar Katyal, Trump v. Hawaii: How the Supreme Court Simultaneously Overturned and Revived Korematsu, 128 Yale L.J. F. 641-656 (2019). Brief of Amicus Curiae United States House of Representatives in Support of Respondents, U.S. Dep't of Commerce v. New York, No. 18-966 (U.S. Apr. 1, 2019). Brief of Amicus Curiae United States House of Representatives in Support of Respondents, U.S. Dep't of Commerce v. New York, No. 18-966 (U.S. Feb. 11, 2019). Nomination of the Honorable Neil M. Gorsuch to be an Associate Justice of the Supreme Court of the United States: Hearing Before the S. Comm. on the Judiciary, 115th Cong., Mar. 20, 2017 (Statement of Neal Kumar Katyal) (CIS No. : 2018-S521-183751). "Merck CEO, Former Acting U.S. Solicitor General to Receive Honorary Degrees at Rutgers-Camden," coverage by Tap Into Camden, April 10, 2019, featuring Professor Neal Katyal. "Barr dodges violate spirit of special counsel process: Katyal," a segment on MSNBC's The Rachel Maddow Show, April 9, 2019, featuring Professor Neal Katyal. "Mueller report rules were written to give Congress access, say experts," coverage by Think Progress, April 5, 2019, quoting Professor Neal Katyal. "Barr's rosy report spin frustrates Mueller investigators: NYT," broadcast coverage by MSNBC/Rachel Maddow Show, April 3, 2019, featuring Professor Neal Katyal.